Woo Hoo! We are now on Part 7 of the series, How to Start Using Herbs! So far, you’ve gotten an overview of herbal preparations in Part 3; general guidelines for dosing and safety in Part 2; and more in depth information and how to about water infusions (teas/decoctions) in Part 4; and how to make tinctures and more in Part 5! And don’t forget Parts 1 and 6 for even more herbal information to help you get started using herbs for your health. This time, we are going to talk about an herbal preparation that most of you are very familiar with….the herbal powders in those little supplement capsules. Did you know there are other ways to take and use herbal powders besides these? Today, I’ll go over the main ways to make and use herbal powders: powdering herbs, making capsules, and how to make an herbal candy called an electuary! You’ll love this last one! I lumped these three herbal preparations into one article because they all have to do with herbal powders. An herbal powder is essential a dried herb (root, seed, stem, flowers, leaves) that have been ground into a fine powder. 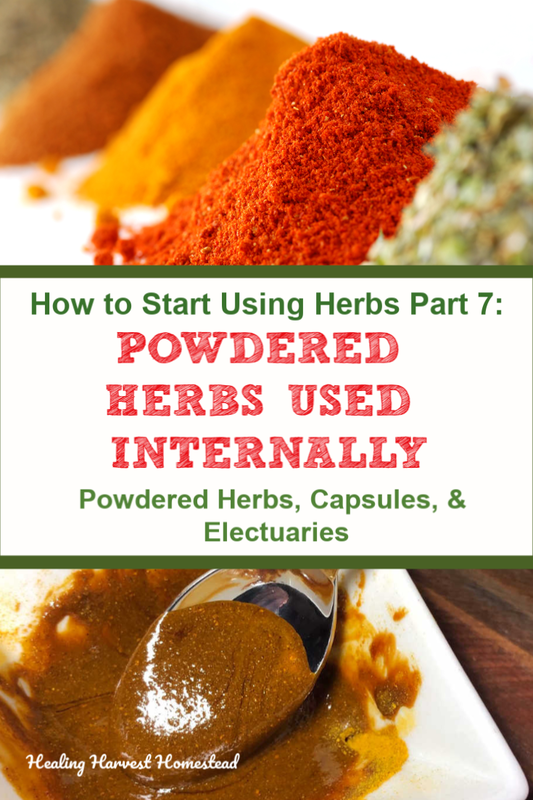 These can be used both internally and externally, however in this article, I’m going to address internal uses of herbal powders. You’ll learn more about external uses in an upcoming article. If you want to get a head start on topical uses of herbal powders, though, you can read through my article on How to Make Your Own Natural Quikclot! Before I get into talking about all the ways to make and use powdered herbs, I want to mention shelf life and storage. Loose leaf herbs will last significantly longer than powdered herbs will. This is because powdered herbs expose more of the plant matter to the air. You can find out more about storing herbs in Part 1 of this series. Herbal powders are quite simple to make. You first dry your herb of choice, and you can find out how to do that in Part 1 of the series, along with other foundational information like how to know which herbs to start using first. If you choose to purchase dried herbs in bulk from a quality herb supplier, you can simply powder these the same as above. You might want to take a look at my article on How to Make & Use Nettle Powder, as there are complete directions and ways to use this particular herbal powder to support your family’s health. After your herbs are completely dried, you can use a good spice grinder or a mortar and pestle to grind your herb into very fine particles. The more finely ground they are, the easier they are for your body to digest them. But with the ease of digestion also comes a downside to finely powdered herbs: They oxidize and become stale much more quickly than herbs in their whole form. Just something to keep in mind. Herbal powders are easy to use! Depending on your purpose for choosing the powdered herb (supporting health, helping with a specific complaint or body system, extra nutrition, etc. ), there are some great ways to use your herbal powders! Here is one of my favorite ways to use herbal powders: in my food. They are easy to add to soups, stews, baked items, and other dishes and may not even affect the taste very much, especially if they are on the mild-tasting side. Stronger tasting herbs like anise, cinnamon, ginger, turmeric, etc. will absolutely have an effect on taste, so if taste is an issue, choose milder herbs like nettle, spinach, kale, chamomile, mullein, etc. If you have children who don’t like their greens, this is a wonderful way to get some enhanced nutritional value from greens into their food without them even noticing! Smoothies allow you to use even more powders, since they quickly blend all the ingredients together. Also, smoothies taste just delicious, even if you add very pungent herbal powders like turmeric and black pepper. Try it! You’ll quickly figure out the right amounts to use for you. This is a GREAT way to get those powdered herbs down! Just give your water a little shake, then swig it down! Essentially, you have a nice tea with the powders suspended in the water, not strained out as with loose leaf tea or tea bags. NOTE: Powdered herbs in water may clump, depending on the herb. If this bothers you, mixing them first in a bit of water to make a paste before adding to your water bottle may help distribute the herb better. Most people are very familiar with capsules, as these are the most common form of herbal preparation found in the stores. Unfortunately, these herbal capsules (in my opinion) are almost always stale and over-oxidated. In addition, inspectors have found that some companies adulterate their capsules with cheaper herbs. Since the FDA doesn’t regulate herbs, since they are a supplement, knowing which capsules to buy can be difficult. If you are going to purchase ready made capsulated herbs (such as the ones you see in all the bottles in the store), be sure you research the company. And I recommend you find products made in the U.S., Canada, or the UK to be on the safe side. If you have access to a licensed naturopathic or integrative doctor, they may know of good brands to work with. Here are empty capsules, and these are what you’ll need to purchase if you want to make your own herbal capsules. One way you can avoid the uncertainty of knowing which brand of capsules to purchase in the big box stores is to just make your own! You’ll know exactly what’s in your own capsules, and also that they are free from fillers and other additives. You can also manage the freshness of the herbal capsules, since you’ll know just how long it’s been since they were made. In addition, you get to choose what you want in them! The capsules are generally clear, and they come in two sizes: “0” and “00”. The size “0” is a smaller size, so if you have trouble swallowing capsules, I’d go for this size. Your machine will come in one or the other size, too, so be sure your capsules match the machine. 3) A capsule making machine. If you are interested in creating your own capsules, I recommend finding non-GMO capsules to avoid any issues. NOTE: I’ll be honest. Making capsules is not my favorite way to use herbal powders. With that said, capsules do make handy single dose amounts for convenience. Once they’re made, they are ready to go! You can make as many as your machine will hold usually within 5 to 10 minutes. And there are MANY more! Pretty much, if you can grind the herb into a fine powder, you can make capsules with it! 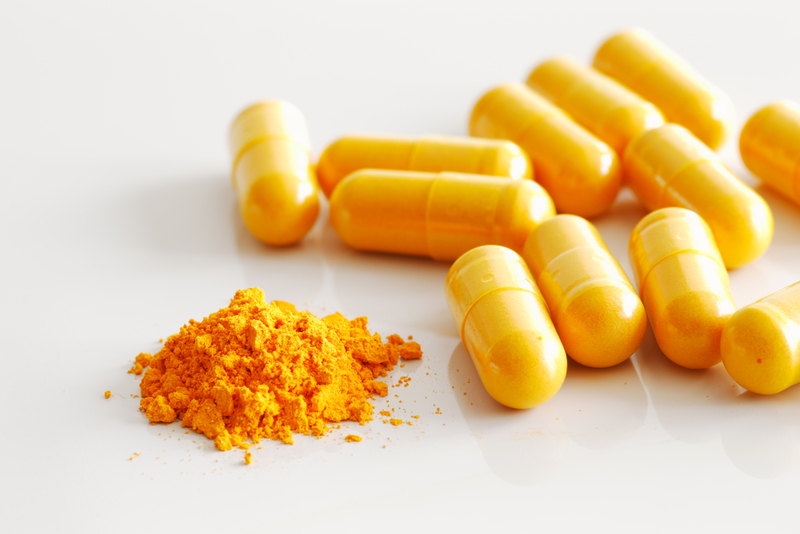 Here are some turmeric capsules…..a really great way to take your turmeric if you don’t like the taste! Remember, turmeric requires a bit of black pepper to go along with it to enhance the bioavailability of the essential compounds. Herbal Capsules? Herbal Tinctures? Culinary Uses? Which is the Best Way to Take Your Herbs? Well, it’s all about the amount you are taking. With culinary use, you are not getting the concentrated herb into your body in as high of an amount as with a capsule. You are using the herb mainly for enhancing taste, although there are still health benefits in cooking with herbs. Tinctures and capsules are fairly similar in the dosing amount, but tinctures can taste pretty bad. If taste bothers you, capsules may just be your better option. However, you do need to consider bioavailability. Tinctured herbs are more bioavailable than the powdered herb, and this is definitely something to consider. Capsules can take up to 30 or more minutes to digest, while tinctures get into your blood stream very rapidly, and actually start entering your body through the mucus membranes in your mouth. I just LOVE electuaries! If you have children, having them help you make electuaries is a great way to get them interested in their own health! Essentially, electuaries are herbal powders mixed with honey or another soft sweetener. Other sweet solvents include molasses, herbal syrups, agave nectar, etc. You can make your electuaries into a soft paste for spreading on toast, or you can make them nice and firm and form them into balls or even hard little pills that can be chewed up. Personally, it’s best to use very safe herbs in your electuaries, especially if you are feeding them to children. Herbs such as nettle, marshmallow, ginger, turmeric, burdock root, etc. (there are many more—just research the ones you’d like to use) are all great to begin with. Here is an electuary with a thin consistency. You can store this in a jar in your refrigerator. Add a spoonful to your tea, water, or cereal in the morning! Yummy! To make your electuary, decide if you want more of a paste that you will keep in a jar in the refrigerator, or if you’d rather form them into fun little balls. You’ll then adjust the ratio of herbal powder to honey accordingly. Simply mix the honey and powdered herb together until you have the consistency you like! I wrote a very detailed article about electuaries, and you can find out more about them there. PLUS, if you want a great liver tonic electuary recipe, you’ll find that there, too. Electuaries are incredibly fun to make and use—-and they taste wonderful! A normal amount to take is a half-teaspoon full to a tablespoon full depending on the purpose and size of the person. You can find out more about general dosing guidelines for herbal preparations in this article. These liver tonic balls are a firmer form of an herbal electuary. These make great little snacks too! Although I’m more of a fan of the whole, or loose leaf, herbs for my own personal use in making preparations, herbal powders do have their place. They are great to use for people who want to take a quick pill instead of dealing with the time constraints of making a tincture or even a tea. They’re also fun for kids to help make too! When children can be involved with their own food and remedy preparation, they are far more likely to 1) take them; 2) enjoy them; and 3) build a foundation for natural health. What a Win! I hope you’ll consider using herbal powders daily, as this is a fun and easy way to add extra nutrients and health benefits to your life! Do you use herbal powders? Leave a comment in the comments section if you have questions or something to add that I may have forgotten here! And stay on the lookout for Part 8, coming up next! There are also a TON more herbal articles over on the blog! Also—-if you’d like access to our Resource Library that contains downloadable eBooks, guides, cheat sheets, check lists, and more…just fill out the form below! P.S. I hope you’ll sign up for the weekly newsletter! You’ll never miss a thing, and you’ll get immediate access to the growing Resource Library filled with eBooks, guides, cheat sheets, check lists, and more for you to download and use at your convenience. These are on various topics I discuss here on Healing Harvest Homestead to further you in your journey to self-reliance! Disclaimer: I am NOT a medical doctor. In no manner, stated or implied, is any wording in this article or anywhere else I write meant to diagnose, treat, cure, or prevent any disease. Please be sure to seek advice from your medical professional before using herbs or essential oils. These statements have not been evaluated by the FDA.